The Omen and Omen Extreme collections are not to be taken lightly. Featuring mahogany bodies (quilted maple top on the Extreme’s), Schecter Diamond Plus pickups, and a fitted contoured heel, these guitars can pack a serious punch while remaining extremely versatile. 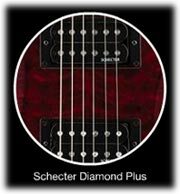 Featuring a comfortable double-cutaway body, the 6-string SchecterOmenExtreme electric guitar in black cherry cuts a beautiful figure while providing full access to the fast maple neck fitted with a 24-fret rosewood fingerboard. It features a quilted maple top on a mahogany body with a string-thru bridge design that adds extra sustain. Controls include master volume and tone with push/pull coil-splitting, and a 3-way toggle switch.